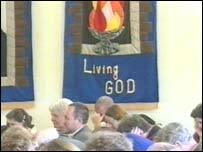 New figures show that Buddhism is now the second biggest religion in Devon and Cornwall. The findings from the recent census also show many Christians in the region are returning to their evangelical roots. Devon and Cornwall had a population of 1,576,186 when the census was taken in 2001. Most describe themselves as Christian - some 899,749 people - with the next biggest religion being Buddhism, with 2,639 practising the faith in both counties. The census also recorded 2,168 Moslems, 1,087 practising Jews, 755 Hindus and 280 Sikhs. Some 198,192 people described themselves as agnostic or atheist. Evangelical Christianity is garnering a strong following in the region. On Sunday mornings in Morval, near Looe, hundreds of Cornish Christians are going back to their roots - congregating in a lowly cattle shed which has been converted into the Grace Community Church. Associate Pastor Andy Rich said of their building: "I think at one time they used to store potatoes in it and it was the place where farmers used to meet. But we acquired it it up and now it's a church." Worshipper Sheila Humphries said: "We just find the Lord is here, the preaching is wonderful and the fellowship is good." Whilst the members of the Grace church make waves within the mainstream, many are opting out of Western faith altogether and following exotic Eastern doctrines. 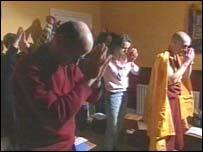 Of the region's Buddhists, many worship at centres in Totnes, Tavistock and Plymouth. Dave Jones teaches Buddhist meditation at a small house in Lipson, Plymouth. He said: "It is a very practical philosophy and psychology that people can use just to help their everyday life and to gain more inner peace." Buddhist monk Kelsang Rabzang said: "It's very popular because it deals with developing a very peaceful state of mind through meditation. "If we're able to maintain a peaceful mind, then any problems that we encounter will be a lot easier to deal with."